Be sure to note the total classes for each month. Some months have 5 weeks. Additional classes may be purchased upon request. *We offer discounts for families, teachers, full time students, active military and first responders. *No refunds on the PIF memberships. *The only “FREE” class options we offer are the “Introduction Classes” or the “Bring a Friend” classes. Note: First month only will be pro-rated based on begin date. Payments due the first week of every month thereafter. There are no refunds. We accept all major credit cards. We require a 30 day notice in order to cancel your membership. If you would like a personalized training plan that addresses your goals, a personal coach may interest you. Two of our CFMH coaches offer personalized programming outside of what is offered through the gym programming. Please contact those coaches directly for what they offer. CrossFit Classes: Intense group training using the Principles of CrossFit with certified CrossFit instructors. CrossFit is defined as constantly varied, functional movement executed at high intensity. This program offers a fitness that prepares you for occurrences in everyday life, at home or at work, on the field or in the ring. The classes include gymnastics, weightlifting and metabolic conditioning (cardio). The workouts are scaled to meet you where you are physically. Level 1 Classes: “Level 1” is a transitional class between the “On-Ramp Program” and the “Regular CrossFit Classes”. 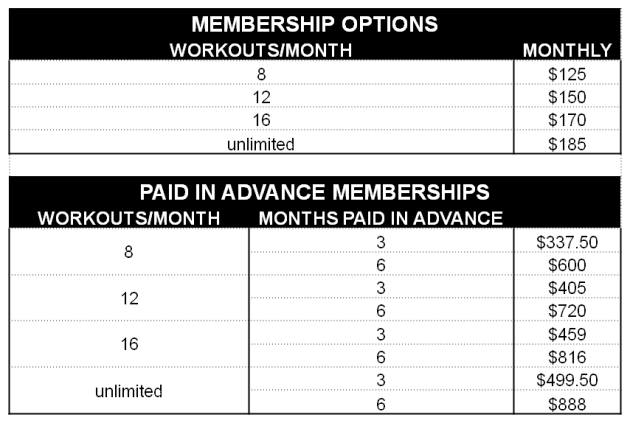 The WOD is the EXACT same in the “Level 1 Class” as the traditional “CrossFit Class”, but the classes are smaller and athletes will learn how to scale and modify the workouts to their level of experience. They will also spend more time practicing these complex movements in order to help them gain the confidence to move forward to the Regular CrossFit Classes. “Level 1” is designed for athletes who are new to CrossFit or need a refresher on tough movements. Skills / Competition Classes: Work on the skills you need to be a more Competitive CrossFit Athlete. The workout will be programmed as a different wod from the normal CrossFit Classes that day. This class will help you work on specific skills you will find at the CF Open and local competitions. It is great for all levels.